This past week, I had the opportunity to watch the documentary short Meeting the Challenge: Senior Athletes Join in Olympic Competition . I'm delighted to have with me Ron Chilton, the star of the film. Welcome to OpEdNews, Ron. Traditionally, when people look at retirement, they think of slowing down. You took off down a radically different path. Can you tell our readers a little about yourself before we dive into your story? Hi Joan. I grew up in Danville, Kentucky, a small town located in the central part of the Bluegrass state. I received my undergrad degree from the University of Kentucky and a Master's from the University of Louisville. My wife and I will celebrate our 47th wedding anniversary next month and we have two grown children. I spent 40 years in broadcasting, everything from D.J. to talk show host to station manager. The transformation began for me in 1995 when I first started contemplating retirement. How would I spend the "golden years?" What activities would be enjoyable, inspirational? Stamp collecting? Water colors? I wanted something more challenging, something that would keep me active. I had always loved sports, but only as a spectator. As a grade and middle schooler, I was usually the last one picked on baseball or basketball teams. I did make the Danville High School basketball team, but was the twelfth man on a twelve-man team. I recall being intrigued with track athletes. So, as I approached my 60th birthday, I made a decision that would impact the rest of my life. I would not go gentle into that good night. I literally adopted the philosophy of the Dylan Thomas poem, to "rage against the dying of the light." I began investigating the opportunities for competition in Senior Games and learned that there not only were annual local, regional, and state Senior Olympic Games, but National Senior Games were held in different cities all over America, every two years. But, could I pull it off? Could I compete successfully as a senior athlete, something that had eluded me as a young man? I had never in my life attempted track and field events such as the high jump, long jump, discus, shot put, or javelin. I watched some instructional video tapes and even hired a retired track coach to train me in techniques of throwing the discus, shot, and javelin. About two years later, I worked up the courage to compete, so I entered some local and regional senior games. It soon became apparent that I was hardly ready to compete successfully against these senior athletes who had obviously been training diligently for years. So, I went back to the drawing board and learned all I could about diet and exercise and strength training. I literally changed my life-style. I refrained from eating red meat, I eschewed soft drinks, fried foods, reduced my sugar and salt intake and adopted a mind set of everything in moderation. I started "grazing" - eating four and five meals a day instead of three heavy meals, including much more fruits and vegetables. I joined a health club, started lifting weights and working out on elliptical machines five times a week and running at least a mile every day. My weight went down from 185 pounds to my present weight of 165. I started winning a few medals and became more and more successful in succeeding years, but it's not only about winning medals, but making life-long friends from all over the country. And the other benefits in a vigorous and athletic life-style at any age are enormous: preventing chronic diseases, gaining strength and better balance, looking and feeling younger, and making fewer trips to the doctor or hospital. You can't help getting older, but you don't have to get "old." Sorry, I've gotten so long-winded, but as you can tell, I'm rather passionate about maintaining an active life-style! I noticed! When you initially explored getting involved in senior sports competition, were your family and friends supportive or did they think you were off your rocker? Most thought I was nuts! My wife (who has finally come around to supporting me) said that I might drop dead of a heart attack on the track. My reply was, "That's the way I would want to go out" rather than rusting away. My room-mate from college said, "Why can't you act 'normal' like the rest of us, and sit in your rocking chair?" Did you consult with a doctor before you embarked on this? Yes, I had a complete physical, cardiovascular and lipid profile tests. So many of my peers are having joint replacements. I never competed in collision sports, so my joints are in good shape! Lucky! When you realized that you really weren't on a par with the other competitors, why didn't you just toss in the towel then and there? It's not like you had been a star athlete in your youth and were just out of shape. I'll admit I was discouraged, especially when it seemed that I couldn't even win a bronze medal. But, it's simply not in my nature to quit - neither in my professional life, when I was told I didn't have the talent to be a top-flight radio announcer, nor in my personal life, when I was told that the beautiful lady I was pursuing would never agree to be my life's partner. But I was persistent, stubborn. I wouldn't take "no" for an answer. So, you don't give up. I see that. How long did it take to translate your unwillingness to give up into a full-blown change in life-style and victories in competition? After making the decision to change my life-style, [it took] 18-24 months for me to lose 20 pounds, gain strength, adapt to a new diet, and to maintain focus on my goal, which was to compete successfully in senior athletic Olympic Games. Victories came slowly - a few silver and bronze medals in local and regional games, then, eventually, gold medals in state-wide competition. Since then, you've been racking up those medals like crazy. What's the total count, to date? And give us the context of that picture of you with all the medals around your neck. You look like Michael Phelps, only more so! Well, thank you very much for the compliment. 257 to date: 143 Gold, 73 Silver and 41 Bronze. 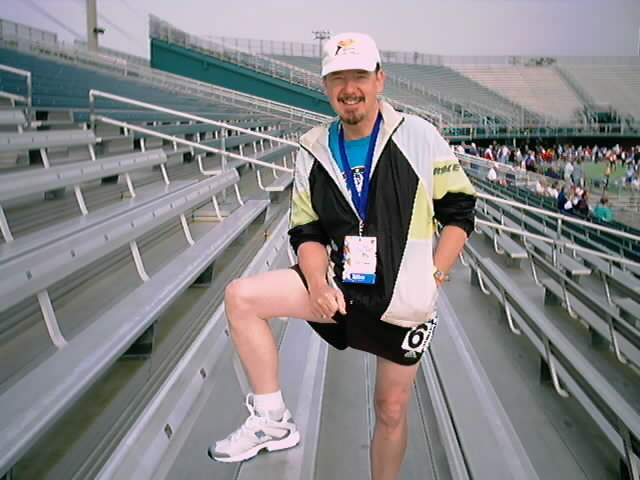 That picture was taken right after I set the record (for track & field events in my age category) in the Kentucky State Senior Olympic Games last October. 10 Gold: in the 100, 200, 400, 800, 1500 meters, 1500 meter Racewalk, Long Jump, High Jump, Triple Jump and Javelin. 1 Silver in Shot Put and 1 Bronze in the Discus. Not too shabby! None of the senior competitions are actually affiliated with the regular Olympic Games that occur every four years. Is that correct? That is correct! The regular Olympics are, for the most part, for young people! But the senior Olympic Games (and the other senior sports competitions) are only for people who have reached their 50th birthday, all the way up to 100 years old and slightly beyond. We hadone guy in the Nationals last year at Palo Alto, CA, still playing in tennis competition at 102! Let's discuss your movie-star status for a moment. I just saw the documentary that you appeared in. How did you come to the attention of filmmaker Dorothy Fadiman? In addition to a 40-year career in broadcasting, I'm also an actor. I've had featured extra roles in 13 major Hollywood films, beginning with "Raintree County" in 1957. Dorothy and I met at the Adirondack Inn in upstate New York where we worked as waiters that summer. Then, we lost touch for 52 years! I looked her up on Facebook last April and discovered that she was an acclaimed filmmaker. After exchanging emails, she found that I was a Senior Olympic Gold Medalist. She asked if I would mind her contracting a videographer to follow my exploits at the Kentucky Senior Games in Paducah last October. And the rest is history, as they say. Incredible! You mention that you were an extra many times. Was this your first starring role? And such an easy one - all you had to do was be yourself. Yes, my first starring role. [As it turned out], Dorothy and I have many parallels in our lives. Both of us are married to our mates 45 years plus, each with two children, and two grandchildren, and both having professions in the field of arts. Are you pleased with how the film turned out? Its debut is later this month at the Derby City Film Festival in Louisville. Do you plan to take time out to cheer it along? I am very pleased with the final product and indebted to so many people at Concentric Media - certainly to Dorothy and her staff, but especially to Keith Parish, the young videographer from Pittsburgh, who was so patient while filming me. I predict a bright future for him. Yes, I will be at the World Premiere of Meeting the Challenge on February 20th. I've already had a couple of interviews about the film and I'll look forward to reading your story in OpEdNews. Thanks, Ron. It's been a pleasure! I loved this film, even before I discovered the connection between star and filmmaker. In a mere eight minutes, I was hooked. I wanted to know a lot more about Ron and the Senior Olympics. That's what led me to contact him for this interview. While Meeting the Challenge is about athletes, it's really about attitude. If we live long enough, all of us will experience the indignities of aging. How will we face what lies ahead? Will we surrender quietly? Or will we fight back, defiantly squeezing every drop out of life, savoring it until the very end? Ron is one-of-a-kind. But he's not alone. There's a whole slew of people who have chosen to greet aging with vigor. His fellow competitors are all winners and, watching them in action, so are we. We feel empowered without having to suit up or even get out of our chairs. Meeting the Challenge poses an existential question. Ron shows us one response. But, ultimately, each of us will have figure this one out on our own.